Pastor Nancy Ruth Allen has been our Pastor since July 2016. She completed 15 years of ministry as a local church pastor (Wisconsin -5 and New England - 10). She graduated from DePauw University in 1977 and the University of Dubuque Theological Seminary in 2004 with a Masters in Divinity. Originally from Attleboro, she was first appointed in Maine when she returned to New England, spent 5 years in Maynard, and three in Spencer. After having been away from Massachusetts for 50 years, she returned to her home state in 2008 and has been here since then. For the past 1 ½ years, she has been working as an Activities Assistant at Christopher Heights Assisted Living in Worcester. She enjoys working with the residents and doing her part to brighten their lives. She also sings in a small ensemble whose ministry is to provide entertain to senior citizens who live in assisted living and nursing home facilities. Her ministry is her primary calling and everything else that she does, except rest, take a back seat to the needs of her vocation. After playing professionally for several years and singing for many years in a church choir, Sandy Tilander began her music ministry with this congregation in 1989 at the former Fairlawn UMC. Her exceeding talent, patience and creativity have enabled her to work and succeed with an everchanging group of choir members. At times the choir has consisted of fewer than five members, and yet Sandy always manages to find music and arrangements that bring out the very best in the singers. 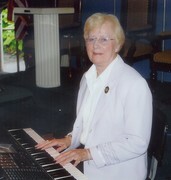 Her ministry plays a vital role in the life of our congregation, and in the lives of all who have sung in her choir. Thanks to Sandy's ministry, music abounds in all Wellspring worship services. We are blessed with a choir director who is rarely if ever critical but who is always uncouraging and complimentary. She has a deep and abiding love of sacred music, and she freely shares it with the choir and with the congregation. Sandy's presence among us adds new meaning to the words harmony and beauty.